There are four popular lynx color points in the Snow Tiger breed. They are: Seal Lynx Point, Chocolate Lynx Point, Blue Lynx Point, and the Lilac Lynx Point. I will describe the Lynx color points and show pictures of these lynx color points as examples. 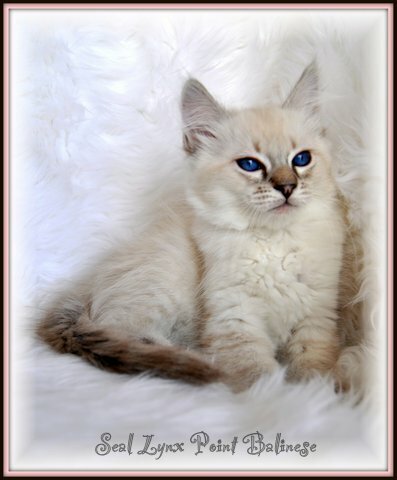 Seal Lynx Pointed Siamese & Balinese cats with excellent contrast will always have a light cream or off white body with light chocolate colored banding (striping) on the four legs. The tail will either be dark colored in solid, or will be ring tailed in dark chocolate almost black. The face will be masked in light black/brown tabby markings, and the nose fur will be darker. The ears will be solid dark. As they age, the marking will become darker, but there shall always be a beautiful clear contrast within the tabby markings and the solid off white body tone. The nose flesh will usually be black completely, but sometimes it can be pink with a dark outline. In the Balinese snow tiger, you will often times find that the tabby markings are lighter because of their undercoat being lighter. Note: I have included a picture of a Seal Lynx Point Siamese, and a Seal Lynx Point Balinese to contrast the seal lynx color point differences in the coat/fur. 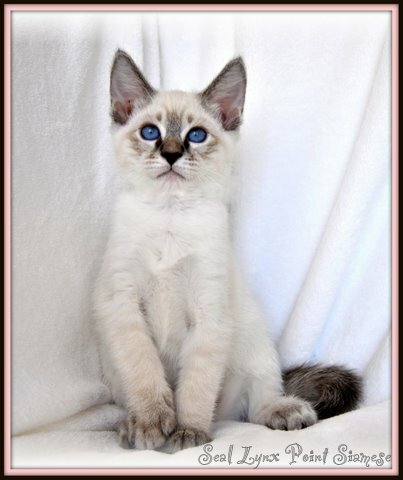 Chocolate Lynx Pointed Siamese & Balinese cats with excellent contrast will always have a white body with dark beige/caramel colored banding (striping) on the four legs. The tail will either be a solid dark brown, or will be ring tailed in brown. The face will be masked in faint light brown tabby markings, and the nose fur will be cinnamon colored more often than not. The ears will be solid light brown. As they age, the marking will become darker, but there shall always be a beautiful clear contrast within the tabby markings and the solid white body tone. The nose flesh will usually be pink with a darker outline. And the freckles will be cinnamon colored to compliment the cinnamon nose fur. 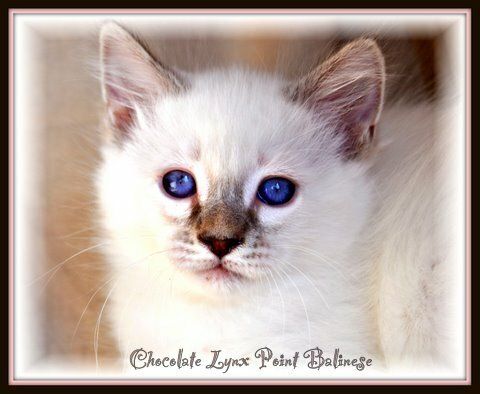 Note: I have included a picture of a Chocolate Lynx Point Siamese, and a Chocolate Lynx Point Balinese to contrast the Chocolate lynx color point differences in the coat/fur. 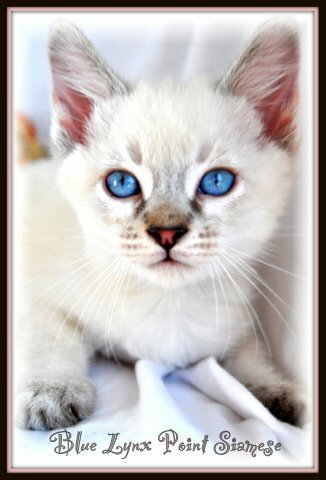 Blue Lynx Pointed Siamese & Balinese cats with excellent contrast will always have a white body with slate gray colored banding (striping) on the four legs. The tail will either be a solid dark gray/black, or will be ring tailed in dark gray/black. The face will be masked in faint gray tabby markings, and the nose fur will be light brown colored more often than not. The ears will be solid gray. As they age, the marking will become darker, but there shall always be a beautiful clear contrast within the gray tabby markings and the solid white body tone. The nose flesh will usually be pink with a dark thick outline. And the freckles will be brown colored to compliment the nose fur. In the Balinese snow tiger, you will often times find that the tabby markings are darker because of their undercoat being grayish/cream. Note: I have included a picture of a Blue Lynx Point Siamese, and a Blue Lynx Point Balinese to contrast the blue lynx color point differences in the coat/fur. The term snow tiger was coined for the similarity in look of the Lynx Siamese cats and the White Siberian Tigers. 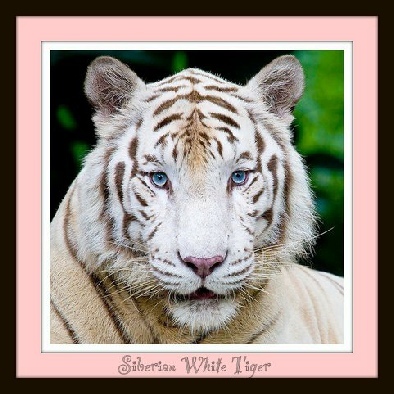 The snow tiger domestic cat exists in both short hair (Siamese), and long hair (Balinese). 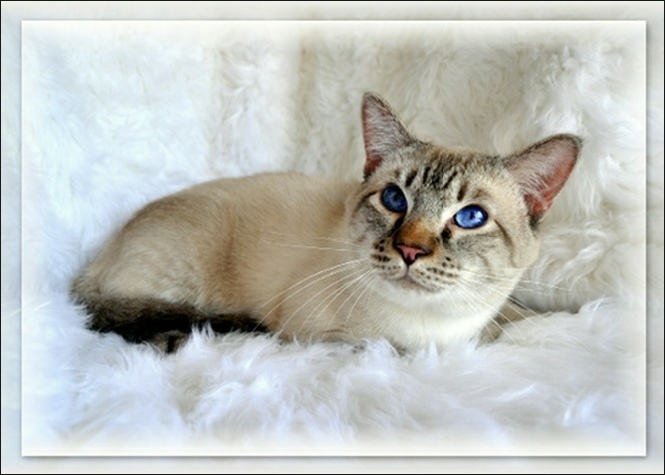 The snow tiger Siamese is basically a hybrid of an apple head Siamese & an Oriental Short Hair, &/Or a Color Point Short Hair (CPSH). 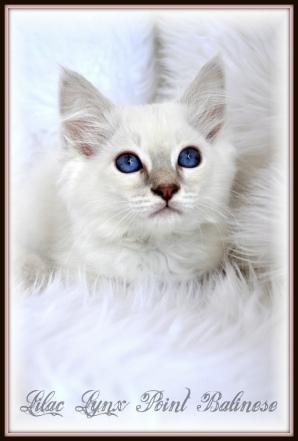 A rise in popularity has started to circulate this Siamese hybrid in recent years, so we are to continue to see more in the future in all four lynx color point varieties (Seal Lynx Point, Chocolate Lynx Point, Blue Lynx Point, Lilac Lynx Point). 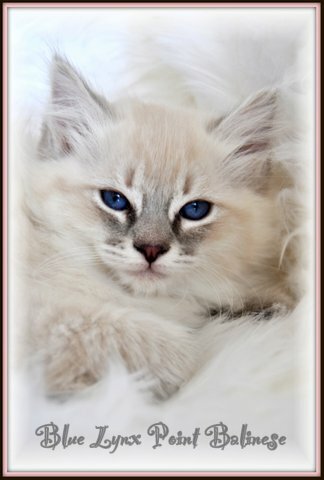 To understand the breed precisely I need to emphasize the Color Point Short Hair/Long Hair, Oriental Short Hair/Longhair, and Javanese breeds as they play a key role in the matrix of the Snow Tiger Siamese & Snow Tiger Balinese (Lynx) breeds. 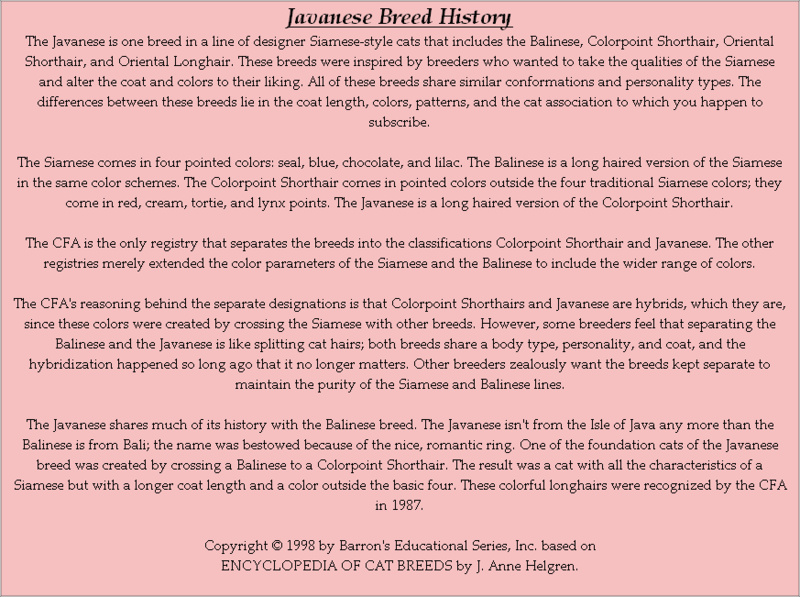 The story of the Color Point Short Hair began as early as 1902, when “tabby point Siamese” were produced and these are mentioned in a book titled “The book of the cat”, by Frances Simpson. 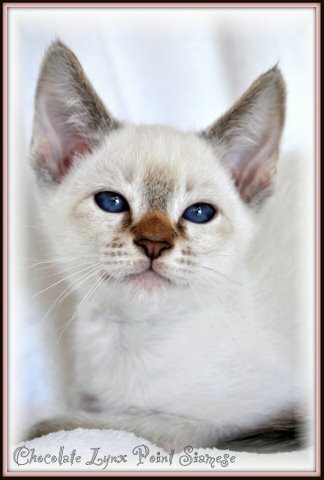 They appeared in Scotland more recently where in 1944-1949 they were called “silver point Siamese”. They didn’t become widely known until the 1960’s when they were introduced to the cat fancy at a cat show in London, England. 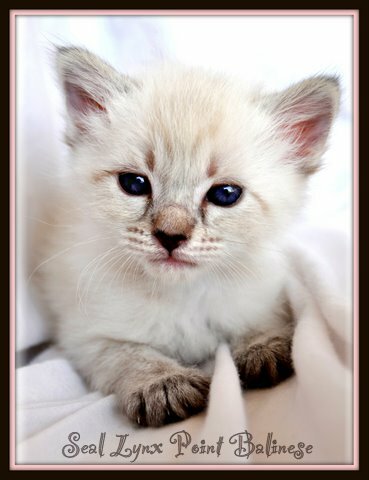 In 1966 they were granted recognition by the Governing Council Of The Cat Fancy (GCCF) as Tabby Point Siamese, and these cats are the foundation for the Color Point Short Hair’s of today. 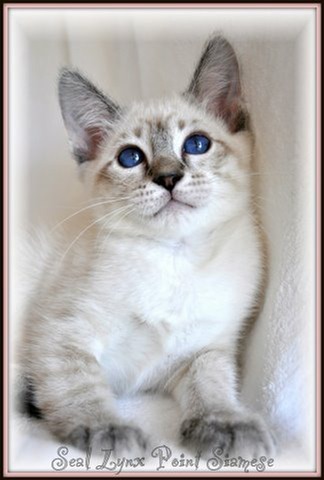 The term “Color Point Short Hair” was coined to identify Siamese cats in other colors and patterns in Registries which did not wish to include them in the Siamese breed group - in Solid Point, Lynx Point, and Tortie (solid) or Torbie (tabby/tortie) patterns and Bi-Color. 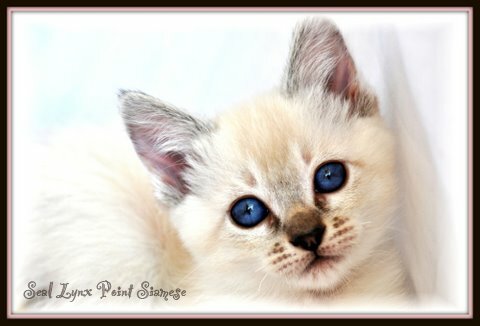 Colors and patterns now available include Seal Point (black), Chocolate Point (brown), Blue Point (gray), and Lilac Point (a pale color produced by the combination of Blue and Red Chocolate genetics), Silver, Cinnamon, and Fawn (a modifier of Chocolate and Lilac), and Red Point (Flame) including Cream Point. Several other registries recognize these varieties as Siamese. 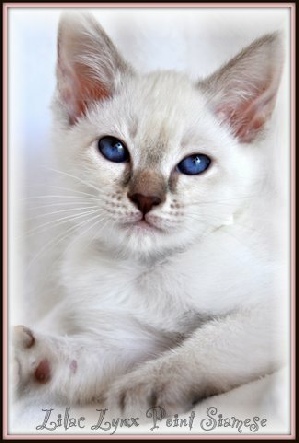 Since the Color Point Short Hair and Siamese are technically the same cat on the surface, the breed standard or description is virtually identical aside from color and patterns. The general body color should be pale and free from hip spots or extraneous patterns and the ears are solid colored (except in Tortie/Torbie patterns) with a characteristic “thumb print” mark. Although the preferred tabby pattern is distinctly striped on the points, some agouti ticked or “Abby Patterned” Color Points have done very well on the show bench. This pattern is especially popular with breeders who want to produce clear reds without the striping. 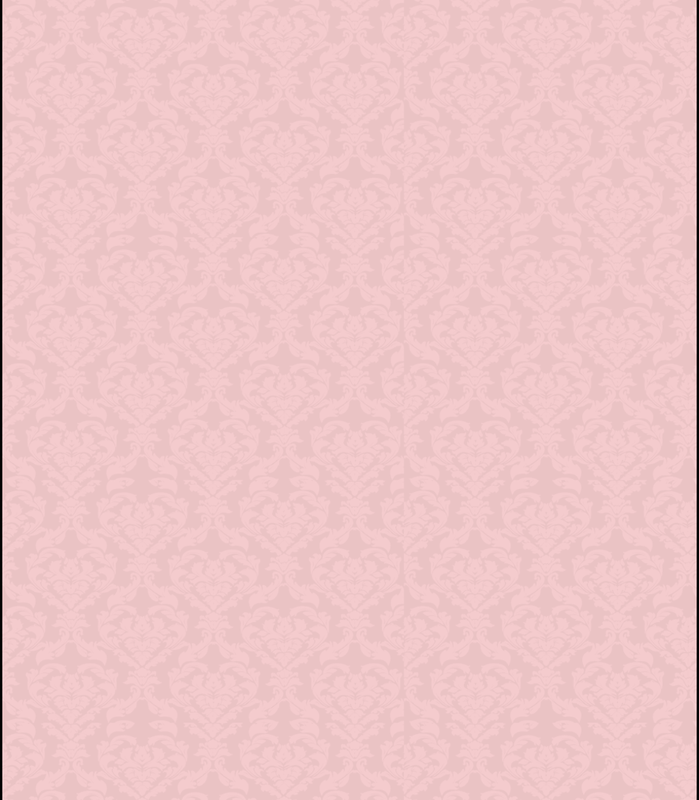 Nose leather (flesh) conforms to the recognized Siamese standard for particular color of points or is pink with a dark outline. The Tabby pattern is dominant, however, two solid points from a tabby point breeding (tabby carrying the recessive solid pattern) will not produce tabby pointed offspring. 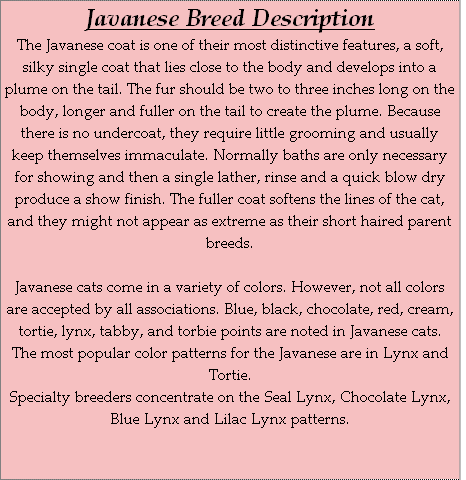 Note: Color Point Short Hair description is the same for the Color Point Long Hair Cat, the only difference being the coat length, and texture. 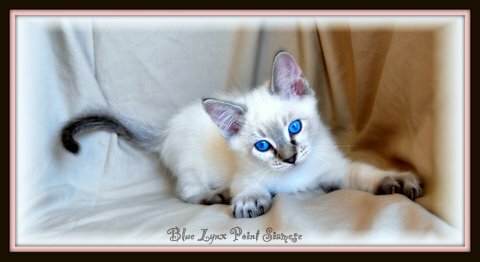 Color Point Short Hairs are affectionate, sociable, and have an interactive personality as well as the high intelligence of the original oriental type cats. 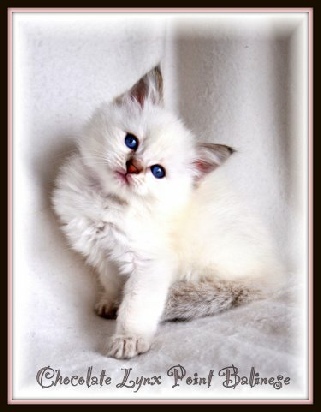 This breed is best suited to extroverts ho enjoy conversation and interaction with their cats. Affectionate and demonstrative, it likes socializing with it’s “people” as well as with other pets in a household. The Color Point Short Hair integrates well into dog households and fetches and leash trains easily. 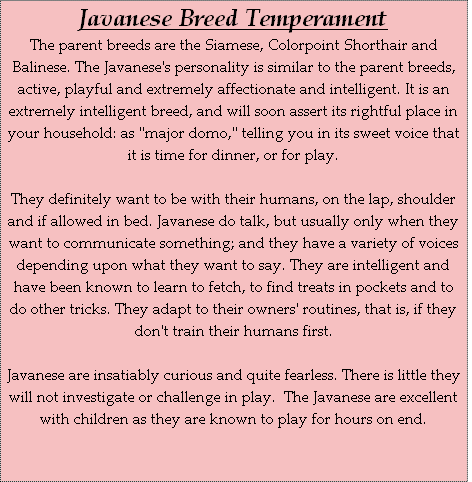 This is a curious, active, vocal, affectionate and intelligent breed. The Color Point Short Hair breed appreciates a “birds eye view”, and is often found on top of the refrigerator or up on a window sill. These wonderful cats are quite capable of creating shenanigans if they are left to their own devices during an extended period of time without attention or supervision. 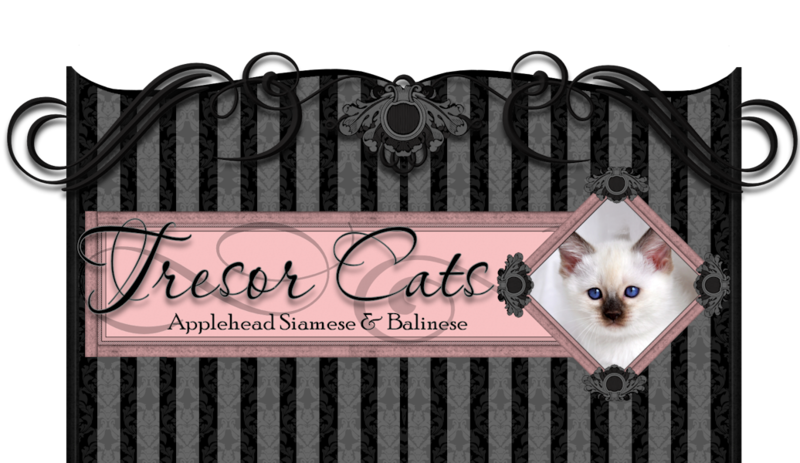 Lilac Lynx Pointed Siamese & Balinese cats with excellent contrast will always have a white body with lilac colored banding (striping) on the four legs (very faint). The tail will either be a solid lilac or will be ring tailed in lilac. The face will be faintly masked in lilac grayish tabby markings, and the nose fur will be light brown colored more often than not. The ears will be solid lilac. 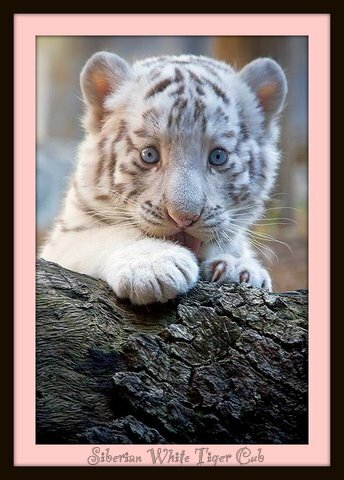 As they age, the marking will become darker on the face and tail, but there shall always be a beautiful white coat to contrast the lilac tabby markings and the solid white body tone. 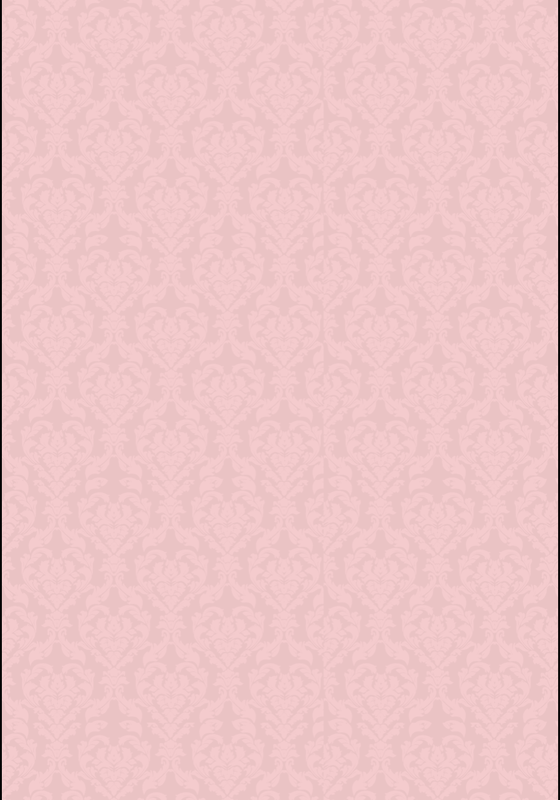 The nose flesh will usually be pink with a darker outline. And the freckles will be lilac colored to compliment the nose fur. In the Balinese snow tiger, you will often times find that the tabby markings are lighter because of their undercoat being pure white. 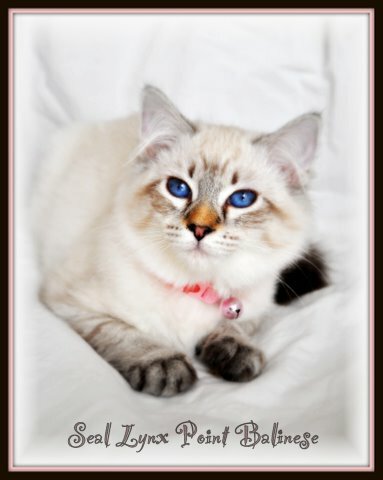 Note: I have included a picture of a Lilac Lynx Point Siamese, and a Lilac Lynx Point Balinese to contrast the lilac lynx color point differences in the coat/fur. "Of all God's creatures, there is only one that cannot be made slave of the lash. That one is the cat. If man could be crossed with the cat it would improve the man, but it would deteriorate the cat." 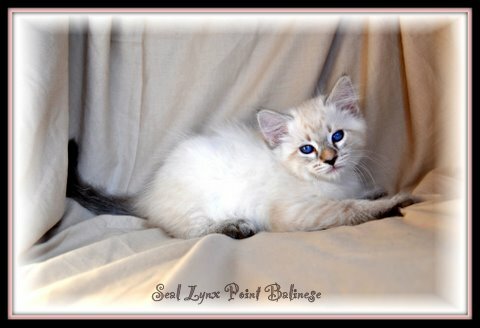 This page is dedicated to the cat that started my lynx point breeding program. 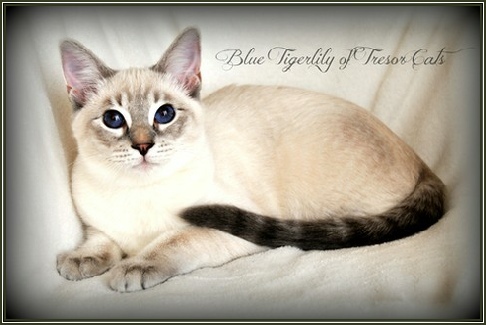 Israel My Glory of Tresor Cats, who is a Chocolate Lynx Point Siamese, that carried the long hair recessive gene. This cat is now retired from my breeding program.